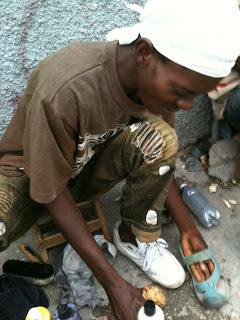 'SHINE" is the Kreyol term for the Shoe Shine lad. I wonder about the etymology of that...? 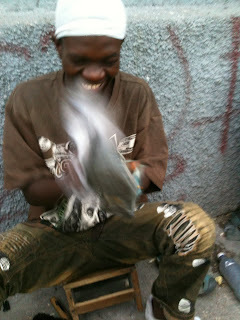 My Haitian friends are BIG on clean feet. And shoes. Next morning, Yveline tells me I need a shoe shine. Gotta have it, girl, she insists. She puts her feet down. Or rather, my feet down. 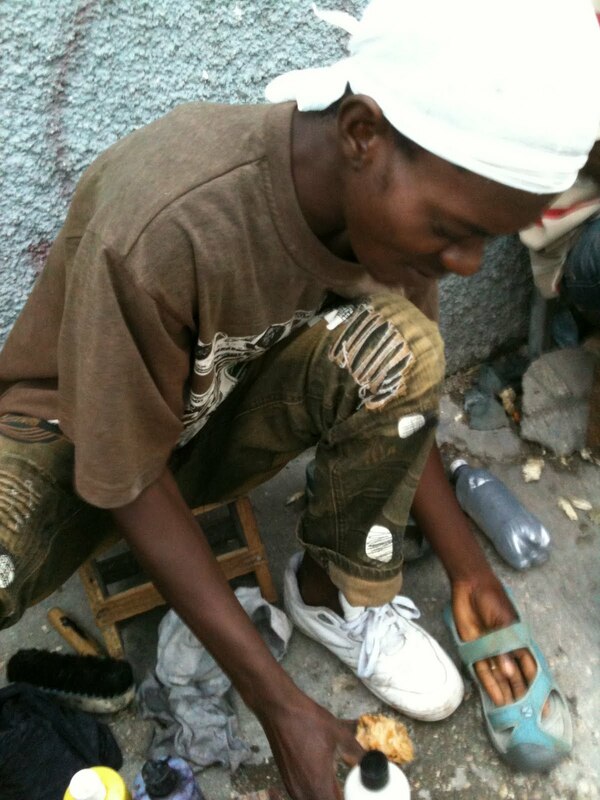 Here’s the shoe shine boy. He (and others) is called “Shine” in kreyol. Now, how did that come into the language, and when? My fascination with the ever wondrous changing mysteries of entries into Kreyol takes over…while he actually shines and cleans: my sandals! Yveline is finally satisfied and I get to ask: How much? I am studying the cost of living here, after all, or rather, as I like to quip, the cost of surviving. I get to ask: So how much do you clear in a day? Is this where you always set up shop? How much for a shoe repair? How much to shine boots? No time was lost, as he was working while we talked. He would be paid, and I might learn something. All this, for one thin dime. Workers outside of factories, “ti machan,” shoe shine boys, peddlers of goods (shoes, sun glasses, pastries, water) made out that they had opportunities to earn more than a factory worker, and that they’d rather take their chances as an “independent” on the street, than in a factory job. I want to stay, watch, learn more, ask more questions but Yveline decides enough is enough and steers me away towards the gate where she and the other textile workers will soon start their long day. It is 6:45 a.m. and I will have a huge hot godet of Haitian coffee and biskwit (hardtack in my personal lexicon). Everyone moves toward the gate, flashing their ID badges. I sip my coffee slowly and ponder going home with the "Shine" boy, see where home is.